I am obsessed with pinterest.com.... like most girls! There are so many fun ideas on there. The problem is: who actually has the time to make something they find on pinterest? Well when I saw this, I knew I was going to make it this weekend.. So I went to a few different Goodwill stores to look for an old spice rack.. Finally on Saturday I found this at Salvation Army for a whole $.99! Sure, It wasn't as big as the one I saw on pinterest.. But thats the fun with all the ideas on there, you can't make them exactly like someone else did. You have to make it your own!! While I was impatiently waiting for it to dry I found a piece of scrap paper I really liked.. And cut it to fit the back of the spice rack..
Next, I screwed on some hooks. This might not have to be done on everyones because they may already have hooks on them. 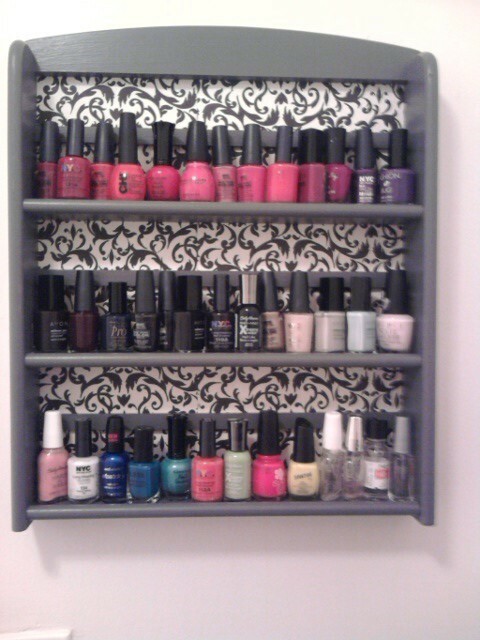 Finally, I hung it on the wall.. and placed my favorite nail polishes on it! Ta-Da! 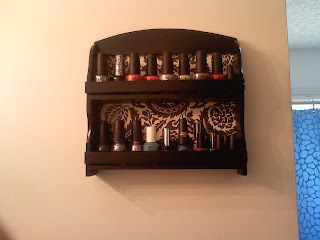 An up-cycled $0.99 spice rack becomes a display rack for my nail polishes! The best part about this project was told to me by my wonderful boyfriend. Josh told me, "When you get sick of using it as a nail polish holder, you can use it as something else." Have you made something off of an idea you found on pinterest? !